Menzerna Super Finish (SF 3500) 128 oz. 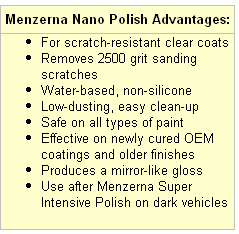 Home > Shop By Brand > Menzerna Polishing Compounds > Menzerna Super Finish (SF 3500) 128 oz. Mist the Wolfgang German Polish N Wax Applicator with McKee's 37 Pad Conditioner to moisten the foam. Apply a nickel size amount of Menzerna Super Finish SF-3500 to the applicator. Work in a back and forth, overlapping motion until the area starts to dry. Wipe off the polish with a damp Cobra Microfiber Towel. Work in 2 x 2 sq. ft. sections until the entire vehicle is done. Note: Applying Menzerna Super Finish SF-3500 by hand will enhance gloss but it will not remove swirls. For paint correction, you must apply this product with a polisher. Make sure the surface to be polished is clean and dry. Fresh paint should be fully cured. Apply Super Finish SF-3500 out of direct sunlight. Use a soft foam finishing pad, like Lake Country’s CCS Black Finishing Pad or the White Ultrafine Polishing Pad by The Edge. Apply a 6 inch line of compound to the vehicle. With the polisher turned off, spread the polish over about a 2 x 2 sq. ft. area. Polish at 1200-1800 RPM (5000-6000 OPM on a dual action polisher) working slowly across and then up and down the area. Check your work after several passes to see if the defects have been removed. If so, reduce the pressure and continue buffing until a high gloss is achieved. If the pad becomes dry, mist it with water and continue buffing. Always apply a wax or sealant after polishing. We recommend Wolfgang Deep Gloss Paint Sealant 3.0 to seal in the shine with its long-lasting polymer formula. About Menzerna Polishing Compounds of GermanyJescar Finishing ProductsMenzerna Polishing Cream Metal Polish German Deep Gloss ComboGerman Final Gloss ComboMenzerna Ceramic Intro KitMenzerna Fast Gloss ComboMenzerna One-Step Polish 3-in-1 8 oz.Menzerna One-Step Polish 3-in-1 32 oz. Menzerna Super Heavy Cut Compound 300 8 oz.Menzerna Heavy Cut Compound 400 8 oz.Menzerna Medium Cut Polish 2400 32 oz.Menzerna Medium Cut Polish 2400 128 oz.Menzerna Super Finish (SF-3500) 8 oz.Menzerna Super Finish (SF-3500) 32 oz. Menzerna Super Finish Plus (SF-3800) Menzerna Control CleanerMenzerna Super Heavy Cut Compound 300 32 oz.Menzerna Heavy Cut Compound 400 32 oz.Menzerna Heavy Cut Compound 1000 32 oz.